Recently finished in 2014, this newly constructed house is a must see. Situated on the hillside in Manuel Antonio, the home captures stunning sunsets year round, and constant breezes form the near Central Pacific Ocean. The builder cut no corners while constructing this home and all appliances, furniture, and electronics are state of the art. The property is just shy of an acre in size and there is room for some small expansion. The property is visited daily by the abundance wildlife in the Manuel Antonio Antonio area including monkeys, sloths, and toucans. When entering the main house you enter into the living and kitchen area where entertainment can easily be fulfilled. Also on the first level there is the master suite with and enormous master bath with full Jacuzzi and his and her sinks. The wood work is amazing throughout the entire home including cabinetry in the kitchen and the master bath. The first floor also boasts ample decking space to relax and take a dip in the infinity edge pool to cool down after a long day in the rain-forest. The second floor consists of two spacious bedrooms with a shared bathroom. 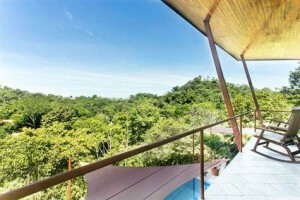 Both rooms have awesome jungle views that really give the guest the feeling of being in the rain-forest. Also there is a small office for the one who can get away from work. Upstairs is also decked out with amazing wood work as well. In all the home has three bedrooms and two and half baths. The home is in the heart of Manuel Antonio and close to all amenities , and also only a three minute drive to the lush and vibrant Manuel Antonio National Park. If you are looking for a slice a paradise look no further because this home captures it all.